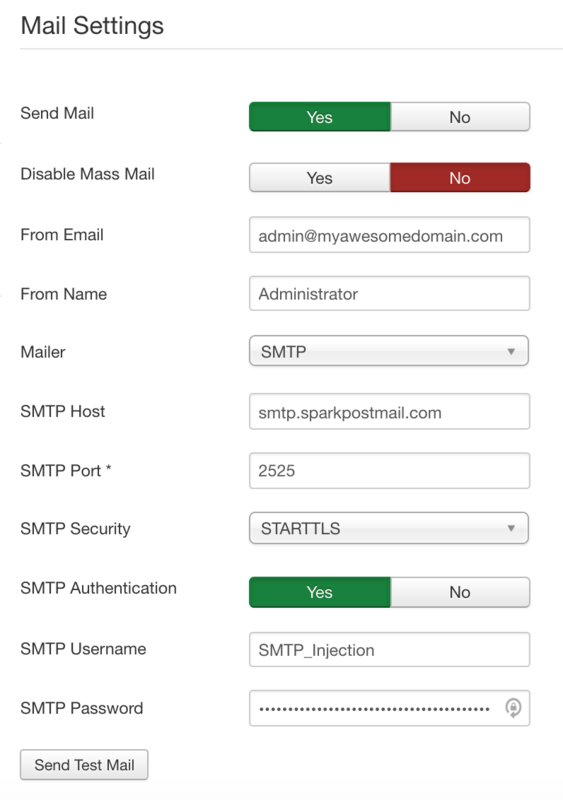 Configuring Joomla to use SparkPost is very straightforward since it can be done from its administration panel. Note: Replace <EMAIL>, <DOMAIN>, <NAME> and <API_KEY> with appropriate values. <DOMAIN> must be one of your verified sending domains. After save, click Send Test Email. It should attempt to send an email to yourself or, otherwise, will show any issues with this setup. If there is any connection problem, you can try using port 2525 instead of 587. If the problem persists, unblock outgoing traffic to port 587 or 2525 from your firewall. If you’re in a shared host, contact your hosting provider to unblock one for you.